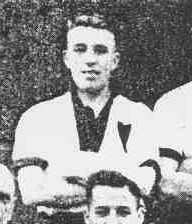 Purvis was a guest player for Exeter City in 1945-46 whilst being on the books at North Shields. He made one appearance in a Division Three South (South of the Thames) fixture at Brighton and Hove Albion in December 1945. He was with Everton from January 1946 to October of the same year after he signed from North Sheilds. His next move was to Plymouth Argyle where he stayed until May 1948. Plymouth Argyle have signed Bartholomew Purvis, right or left-back, from Reading as a part-time professional. No transfer fee is involved. Purvis, who is 25. He has played for Everton and Gateshead, and for Chelsea and Reading as guest star while in the forces. A native of Newcastle, is 5tt. 9in. and weighs 12 stone. Together with several other clubs Argvle negotiated for Purvis during season 1945-46 while was with Everton, but he declined to come West at the time. Purvis, a joiner s apprentice, joined Everton during the war as a professional. After demobilization he signed for Gateshead. When he asked for transfer to Reading the latter club were unable to fix him and he requested a free transfer. Argyle, who were still keen to obtain his signature, then made arrangements for him to continue his apprenticeship in Plymouth." Notts County then signed Bartholomew where he played 25 times until he left August 1951 to sign for Carlisle United. He played 4 times for them,. Bartholomew died in June 2001.